The Spring Coordinators meeting for the Eastern Wyoming College Outreach Coordinators was recently held in Douglas. Coordinators and support staff present were: Back L to R: Judy Branson, Torrington; Monica Wilcox, Lusk; Brandy Donner, Newcastle; Sue Trautwein, Wheatland; Sandy Engling, Glendo; Margaret Farley, Glenrock; Connie Woehl, Douglas; and Sue McBride, Douglas. Front L to R: Candice Watt, Upton; Melissa Buckmiller, Moorcroft; Judy Hart, Sundance; Magan Paulson, Lusk; Kim Conzelman, Newcastle; Kim Weitzman, Guernsey; and Jamie Sullivan, Douglas. 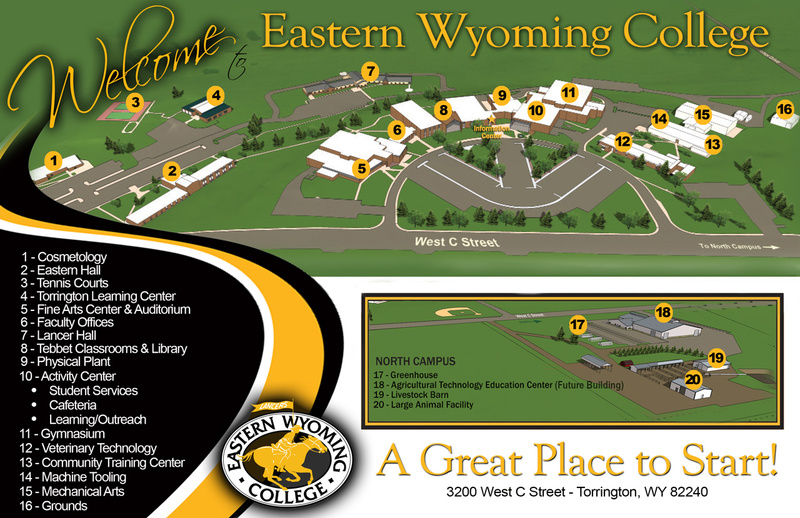 Eastern Wyoming College women’s basketball coach has announced the signing of several star players to fill the roster this upcoming season. Hannah Earley, 5’5″ guard from Campbell County High School in Gillette, Wyoming has signed a letter of intent to play for the Lancers. She is known as a hard-nosed defensive player and comes from one of the premier programs in the state of Wyoming. Lacy Leaf, 5’10” wing player from Cheyenne-Eagle Butte, South Dakota will also join the Lancers. She is a versatile player who led her team to a 17-5 record and the Championship of the Lakota Nation Invitational Tournament where she was names MVP. Bailey Limpy, 5’8″ guard from Lame Deer High School, Lame Deer, Montana has also signed to play for Coach Andersen. She averaged 13 points, 13 rebounds, 4 assists and 4 steals and served as 2 time team captain for the Lame Deer Morning Stars. She helped to lead the Lady Morning Stars to their first championship game in school history. Shauri Lyon, 5’11” post player from Manti High School, Manti, Utah will also join the Lancer roster. She is a strong and athletic player who will add strength and rebounding in the paint. She was recognized as the MVP this past season. Shickerra Marsh, 6’0″ post from Manvel High School in Pearland, Texas is also joining the Lancers. She is a strong inside player who can post up well and is an excellent rebounder. She averaged 10 points and 11 rebounds this past season. Jessica Santistevan, 5’6″ guard from Pinnacle High School in Denver, Colorado has also signed. She is a very strong three point shooter who can handle the ball and has a great court sense and feel for the game. She averaged 14 points per game and led her team in assists. Jubilee Sutherland, 5’6″ guard from Glennallen, Alaska will also play for the Lancers. She is a great three point shooter as well as a strong ball handler. She averaged 22 points, 6 rebounds, 4 assists and 4 steals her senior year. “I am excited to add these student athletes to our program. They are all great team players and have individual talents that will move our program to new heights. Coming off a 15 win season, combining these players with our returning players makes me very excited for next season,” shared Coach Andersen. Eastern Wyoming College will soon welcome nationally recognized diversity speaker Dr. Mario Rivas to the main campus in Torrington, Wyoming. Dr. Rivas will be on campus on April 5-6, 2010. Dr. Rivas has taught at the community college, undergraduate, and graduate levels of higher education. Currently, he is a full-time professor of Psychology at Merritt College in Oakland, California, teaching a full-range of Psychology courses. As part of his assignment at Merritt College, he is responsible for working with local high schools to increase the enrollment of Latino/a college students. and assist students in promoting greater student responsibility for learning. Dr. Rivas will also be providing a presentation at Torrington High School on the morning of April 6. He will be addressing students, faculty, staff and administrators. Following completion of his doctorate, he assumed the position of Director of the Undergraduate Advising Center at San Francisco State University, where he also developed the Learning Assistance Center. Dr. Rivas also served as Associate Dean of Undergraduate Studies at San Francisco State University, and Vice President of Student Services at Berkeley City College. Dr. Rivas left SFSU to become Vice-President of Student Services at Berkeley City College, a position he held for seven years. Dr. Rivas has also served as co-chair of the Multicultural Concerns Commission of the National Academic Advising Association (NACADA) and has authored and co-authored several chapters and articles focused on improving the achievement and learning success of students of color. Dr. Rivas served as Assistant Director of the Martin Luther King Undergraduate Leadership Advising Office, which served as the primary advising department for students of color. For more information about Dr. Rivas’ presentations at Eastern Wyoming College, call Anne Gardetto, Student Services Associate Director at 307.532.8328. EWC to host "Presentations/Perceptions of the Body and Self"
On Wednesday, March 24, from 12:00-12:50pm in Tebbet 131, Eastern Wyoming College will host the panel presentation, “Presentations/Perceptions of the Body and Self,” featuring Meg Van Baalen-Wood and Nita Kehoe. This presentation explores how our perceptions of self, normalcy, and stigma are shaped by history as well as social and scientific constructs and limitations. Starting with intersections in the presenters’ work with film, art, medicine and politics, they will explore a few of the many factors that influence beliefs and behaviors and then examine how these perceptions perpetuate our expectations, behavior, and social norms. Meg Van Baalen-Wood teaches professional and technical communication, both online and in the traditional classroom at UW. As coordinator of the Professional Writing Internship program, Wood also works closely with undergraduate professional writing minors and local/state employers. Wood frames her pedagogy and research around the notions of interdisciplinary and intersections among creative and technical discourses. She is also a creative writer, poet and technical communications consultant. Nita Kehoe is a professor of art at Central Wyoming College. She has an MFA in sculpture and teaches a wide array of studio art courses. She is also a practicing artist who conceptually focuses on human anatomy. A light lunch will be provided during the event. This event is free and open to the public. The presentation is sponsored by reVisioning the (w)hole, EWC Honors Program, UW Outreach School, and UW Foundation. For questions, please contact Annie Hilton, Honors Program Director, at 307.532.8286. Lancer Women’s Basketball Team Receives Several Awards. The 2009-2010 Lancer women’s basketball season was successfully topped off by the recognition of several players. Team awards included the following: outstanding offensive player: Jessica Brown; outstanding defensive player: Danielle Brown; most improved player: Sarah Smith; lady lancer award: Sarah Smith; and most valuable player: Jessica Brown. Wyoming Conference award winners were: 1st team all conference to Jessica Brown and 3rd team all conference to Danielle Brown. Academic All Wyoming Conference players were Danielle Brown, Jessica Brown, Sarah Smith and Jayde Schelling. To qualify as an Academic All Conference player, the athlete must have a grade point average of 3.20. Academic All Region IX players were Danielle Brown, Sarah Smith and Jayde Schelling. To qualify as an Academic All Region IX player, the athlete must have a grade point average of 3.25 for a minimum of 2 semesters. Jessica Brown was also selected to the All Region IX team. The Eastern Wyoming College Athletic department has announced that on Monday, March 1, 2010, all admissions and 50/50 proceeds raised at the Lancer Men’s game against Western Nebraska Community College will go to the Travis Sims family. This will also be the last home game for the Lancers. Tip-off is scheduled for 7:00 in the Verl Petsch Jr Gymnasium.